Favorite Backlist Books So Far This Year. Yes, I’m kind of cheating. The original top ten topic today on The Broke and the Bookish is “Top Ten Books I’ve Read So Far in 2015”. Well, I didn’t cheat, I just interpreted it in a way that works for me. You see, the requests I’ve made this year for new releases has reduced significantly. That’s not to say I’m not excited for new releases, it’s one of my most favorite posts to do each month. I LOVE ALL THE BOOKS! But when I looked over the list of books released in 2015 that I have read that are a favorite so far this year, I only came up with seven. 7!! Ouch. Not sure what to make of that. It just means that so many amazing new books are going to be read this year, right? A goal of mine this year is to read more from my TBR list and so here we go. Mrs. Hemingway – Naomi Wood (2014). Love historical fiction and Hemingway? Pick this one up. The Golem and the Jinni – Helene Wecker (2013). This was my favorite book read at the library book group this year. Love, love, loved it. The End of the Affair – Graham Greene (1951). The only classic I’ve read this year and so enjoyed Colin Firth’s narration. Didn’t love the ending or the “twist” but overall, it was a fantastic read. The Shell Collector – Anthony Doerr (2001). This was a beach read over Spring Break and was everything I hoped it would be from Doerr. Excellent collection. When Women Were Birds – Terry Tempest Williams (2012). This memoir, essays and poems affected me so. I bought a copy for my boss who became a dear friend (and has moved on to other things, *weep*). I tagged the heck out of it and still return to it when I need a boost or reflection when times get crazy. The Temple of Air – Patricia Ann McNair (2011). Another collection of shorts (these ones linked) that have a forever home on my bookshelves. I wish she had more!! Dreaming In Indian: Contemporary Native American Voices – Lisa Charleyboy and Mary Leatherdale (2014). You guys, this book! More suitable for teens than middle grade and this collection of poems, essays, short stories, photos and art was breathtaking and difficult to read. The One and Only Ivan – Katherine Applegate (2011). Not sure why I picked this one up but so happy I did. This middle grade fictionalized story of real life Ivan is such a feel good story. At the root it’s heartbreaking to imagine the thoughts of an animal in captivity (and when you seek out the real book, grab tissues) but it’s done so well. Are You There God? It’s Me Margaret. – Judy Blume (1970). This was a reread for #BlumeALong and held up beautifully after almost 30 years of when I first read it. Citizen: An American Lyric – Claudia Rankine (2014). I just finished this and don’t really know how to put together a review. In the same vein as Dreaming In Indian, it’s a must read. When you’ve been fortunate to never have gone through racial prejudice, it’s challenging to do a book review about it justice. But I’ll try this week. Just to say, “please read it” should be enough. What are some of your favorite reads so far in 2015? 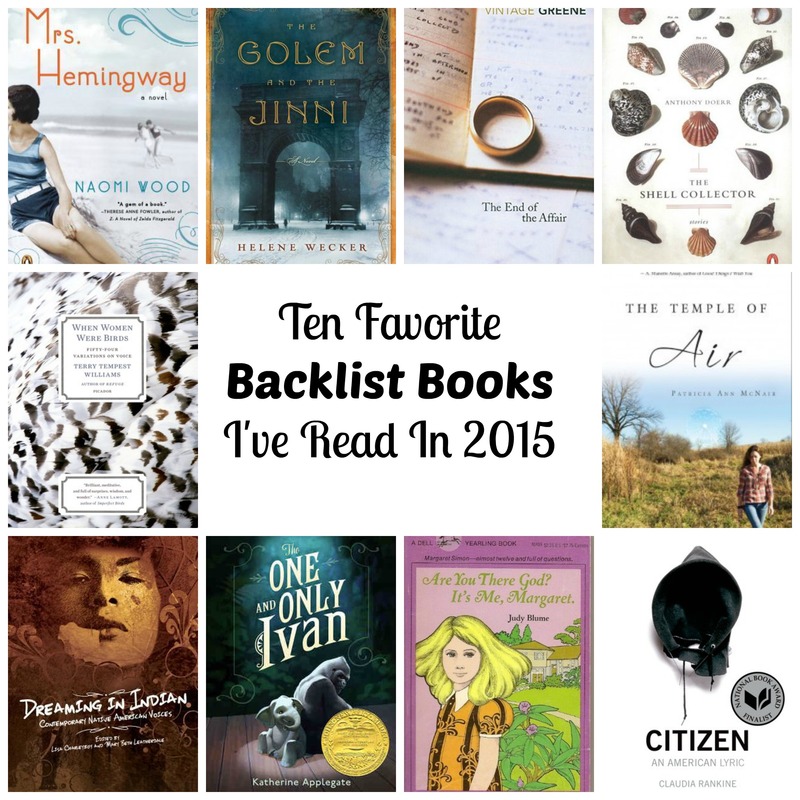 Tags: backlist books, favorite backlist 2015, top ten tuesday. Bookmark the permalink. Previous post ← #BlumeALong With Are You There God? It’s Me, Margaret. The Shell Collector has been on my TBR forever. One of these days! I’ll have to check out Mrs. Hemingway, too. I wonder, did you read The Paris Wife? I highly recommend it., and also reading A Movable Feast along with it (if you haven’t read them both already). Ever since reading Mrs. Hemingway, I’ve wanted to read The Paris Wife. Haven’t read A Movable Feast either but both are going on my TBR list. Thanks! I’ve heard great things about The Shell Collector. It sounds like a book that I would love. I really enjoyed it. After reading All The Light We Cannot See and loving Doerr’s writing I wanted to read his other books. Both are short story collections. I don’t think you cheated at all. Great, varied list. We share a couple in common and of course I read Shell Collector because of your recommendation, so keep ’em coming!I Ivan was a heartbreaker, wasn’t it? Thanks! Yes, Ivan crushed me. I know you have an affinity for animals (as do I) so it really struck a nerve. I haven’t heard of Dreaming in Indian, but it sounds really good. I’ve seen The Shell Collector around, but wasn’t sure if it was fiction or narrative non-fiction. It almost looks like a textbook! The Shell Collector is a collection of fiction short stories. Not linked, but all to do with relationships with nature. Very unique and the writing is beautiful. I really liked The Shell Collector too. Great list! Yay and thanks! I want to read his other collection, Memory Wall, but haven’t gotten to it yet. I’m so in love with so many of these books, especially Mrs. Hemingway and When Women Were Birds. I’m glad you’re finding great books – whatever they look like! This totally isn’t cheating! I decided to interpret this week’s prompt as “the ten best books I’ve read this year, regardless of publication date,” but then I had too many books so I think I just crossed out the ones that aren’t out yet 😛 But there are a few backlist books sprinkled in! I neeeed to read The Shell Collector and When Women Were Birds! And I have so much love for Citizen and Mrs. Hemingway. Obviously I loved When Women Were Birds! Several other of these are on my TBR list as well, and I’ve been side-eyeing The Golem and the Jinni lately…..
Great list! The Golem and the Jinni has been sitting on my shelf for so long, I feel guilty every time I look at it. You make me want to read it right now!